Take the pledge to pack a healthier lunchbox and start the school year off right with tips, lunchbox ideas and coupons. Plus, you could win an iPad and iPad mini to help in recipe planning, just by taking the pledge. Head over to PowerYourLunchbox.com for lunchbox ideas and recipes! After a successful launch last year, Produce for Kids is encouraging families nationwide to kick off the school year right by pledging to pack a healthier lunchbox August 3 through September 18 at PowerYourLunchbox.com. The Power Your Lunchbox Pledge™ website offers tools and tips for families and classrooms on eating healthier lunches, after-school snacks, and weekday dinners with recipes inspired by Eric Carle’s popular literary characters including The Very Hungry Caterpillar™, Brown Bear, The Very Grouchy Ladybug and The Very Busy Spider. Plus, those that take pledge will receive coupons and chances to win prizes throughout the campaign. For every online pledge, lunchbox-friendly companies supporting Power Your Lunchbox Pledge will make a collective $1 donation to Feeding America® children’s programs such as Kids Café, Backpack program and Child Hunger Corps. New this year, PowerYourLunchbox.com has a complete teacher resource page that provides teachers in grades K-5 with fun, free nutrition-focused downloadable lesson plans, certificates for their students, take home materials for families, and the ability to take the pledge as a classroom. One lucky classroom will be awarded with a costume character visit from The Very Hungry Caterpillar, from Eric Carle’s well-known children’s book. Take the pledge. 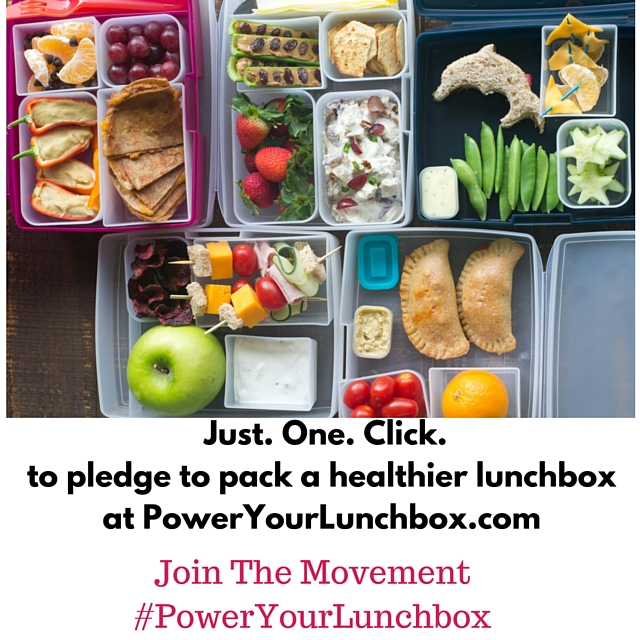 Pledge to pack a healthier lunchbox at PowerYourLunchbox.com. Companies supporting the program will make a donation for every pledge taken. Donations will support children’s programs through Feeding America.